Senior Home Care Agencies provide Caregivers with a Plan of Care for each client. The daily routine is reviewed with the Caregiver prior to the assignment. The following describes the primary responsibilities expected of Caregivers employed by Senior Home Care Agencies. Various additional duties may be required when assisting a bedridden client or a client in a nursing facility. Most Senior Home Care Agencies will require a Caregiver to have Certified Nursing Aide training for certain assignments. 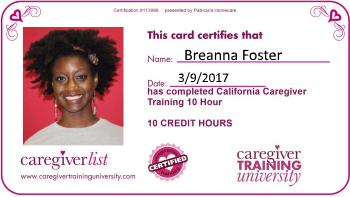 You may also obtain the skills for senior caregiving by taking the 8-hour line Caregiverlist Caregiver Certification training course.